In this complete Arcticor cooler review, we’ll take a good look at both the product and the brand behind it, and decide whether or not the U.S. patented ice chest (which is also a successful Kickstarter recipient) is an overall bang or a disappointing bust. Arcticor Coolers (Amazon link) are an interesting new design that are built to keep an open beverage icy cold from the time it’s cracked open, until the very last sip. We’ve all been there before when you grab a fresh, icy beer or water from the cooler on a hot summer day, only to have it be luke warm by the time you’re halfway done drinking it. So that being said, we really do like this new design, where the four integrated cup holders are recessed down into the ice supply, providing a constant chill for your opened drink. Owner/operator/inventor of the brand Jay Perry says he got the idea when he was sitting on a Florida beach going through can after can of beverages, pouring them out and opening a fresh cold one every time the previous one lost its chill. Which, on a hot summer day in Florida, is quick. But does the design actually work, or is it just another cheap gimmick? 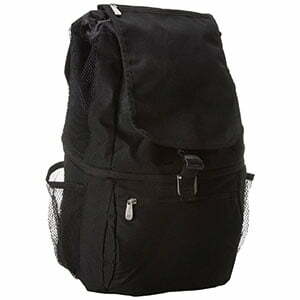 Design-wise, these are revolutionary, totally original coolers that have earned U.S. patent # D690,999. 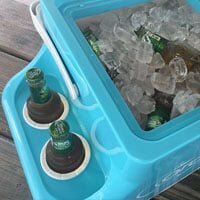 While a lot of coolers have integrated cup holders, none of them have fully recessed cup holders that did down into the ice supply of the cooler. Not only is this design unique, it is totally functional as it allows your open drink to sit in a ‘chilled chamber’ and stay frosty cold, even on the hottest of summer days. In fact, the inside of the cupholders have been proven to maintain a temperature of 38 degrees, even in 90+ degree weather. So, no more warm beers or water while you’re lounging around the pool, beach, or boat. One thing that customers have mentioned from time to time about Arcticor Coolers is that they’re a bit heavy, bulky, and can be a little awkward to carry around for long distances. 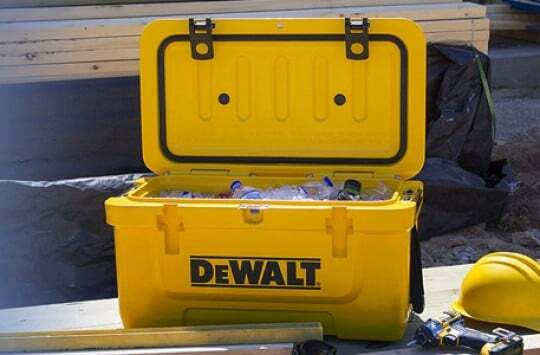 The cooler itself is designed to hold up to 24 cans or bottles, plus a 10 lb bag of ice. (However, that’s including the four cupholders on the outside – you can fit 20 cans/bottles on the inside with 10 lbs of ice, then have four more drinks in the cupholders on the outside). 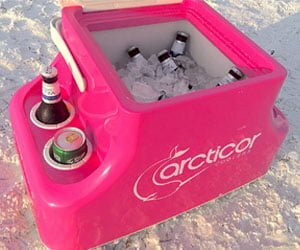 The owner/inventor of Arcticor Coolers, Jay Perry, makes it clear that these ice chests are not meant to be competition to super high-performance coolers like YETI’s or Pelicans. Instead, they’re geared towards families who enjoy spending a lot of afternoons outdoors, whether they be camping, lounging at the beach, out on the boat, or off at their kid’s soccer games every weekend. 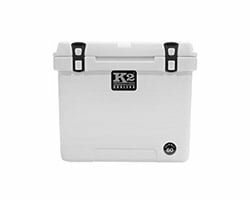 The coolers themselves are built with the same rotomold-style construction as YETI’s, but the big difference is they don’t have the same insulation – their side walls are much thinner. However, this design is purpose-built; having thick-walled insulation would defeat the purpose of the cooling cup holders – if the walls were too thick, none of the cold from the inside would be able to radiate outside to the cupholders. For this same reason, you can’t expect ice to hold nearly as long as you would for something like a YETI. That being said, though, these are still rotomolded coolers that will perform much better than something like a standard Igloo or Coleman – expect them to hold ice for up to two days. Also, the heavy-duty polyethylene construction makes them definitely built to last; you can sit on them, stand on them, basically do whatever you want to them and they’ll hold up just fine. They’re not as indestructible as something like a YETI (which are supposed to be able to survive falling out of a truck bed at 60 mph, but they’re darn close). Arcticor Cooler Review: What are People Saying? 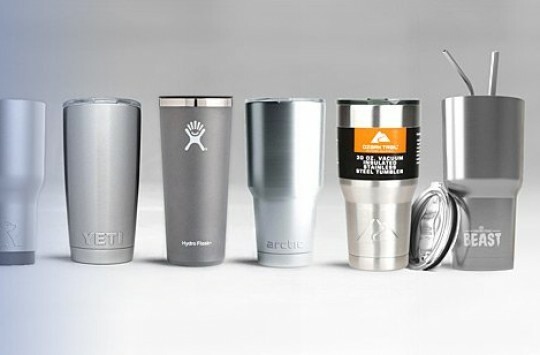 The Arcticor Ice Chest hasn’t even been on the market for two years yet, and it is a really small company – as far as we know, there are only a handful of people that run the whole business, including the founder/inventor/owner. So far, sales and feedback from the users appear to be positive. In fact, the brand just opened a new warehouse in New York (in addition to the original one in Florida), so they must be doing OK as far as revenue and profit are concerned. Regarding performance, whenever something like this comes on the market with such a unique new feature, it’s safe to say that people tend to be a little skeptical. 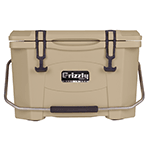 However, the coolers so far seem to have passed the ultimate test of customer satisfaction. That is to say, as far as doing what they’re marketed to do (keep open drinks cold in the chilled cup holders), they work great. Lots of people have claimed that they’re pleased with the overall performance, and have commented that it’s clear the design was well planned and well thought-out. The only negative thing they have to say about it is, like we mentioned earlier, the ice chests tend to be a little heavy and bulky – not recommended for carrying long distances. Also, a few people mentioned they would really like to see a built-in drain plug in future models, because at the moment you have to tip the cooler over in order to drain it out. (However the owner says this was done intentionally, because you don’t want to get rid of the slushy cold water inside – that’s what mostly helps to encapsulate the cup holders and keep them cold). 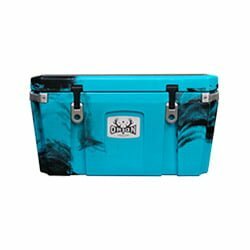 At the moment, the Arcticor Ice Chest is only available in one size – it’s a 28L cooler that measures about 22” x 13” x 14”, and currently, there are four different colors to choose from: turquoise, red, pink, and blue. They do have a pretty good warranty, with a 5-year manufacturer’s guarantee that covers any sort of defects – not bad at all consider the more than reasonable price tag. Amazon is definitely the preferred choice when it comes to finding Arcticor Coolers for sale online – they’re currently on sale at a discounted price from the official website, and they have every color in stock and available with free shipping. 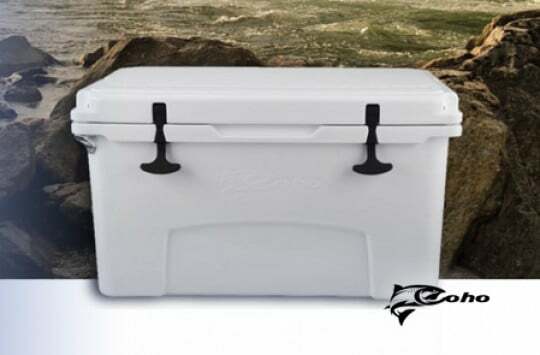 Also, Amazon carries the new cooler float that Arcticor just released, which is a little blow-up float that’s built specifically to hold the Arcticor cooler while you’re swimming or lounging around in the pool, at the lake, or on the beach. 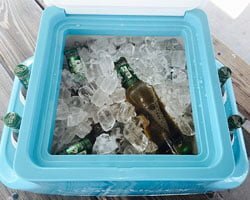 All in all, our Arcticor Cooler review gets the go-ahead green light on customer recommendation; these are fun, unique, smart, and fully-functioning ice chests that offer something literally no other cooler on the market can offer — built in chilled cup holders that’ll keep your drink frosty from the time you crack it open til the time you take the last gulp. Check it out on Amazon right here. Here’s a good video of the internal construction of an Arcticor, which helps you visualize how the ice fully encapsulates the drink holders from the inside.